September 2016 is the twelfth annual National Campus Fire Safety Month. Since the program started in 2005, it has seen a lot of growth with more schools and communities doing fire safety education programs. Over 350 proclamations have been signed by the nation’s governors during this time, but most importantly, we have seen fire deaths going down. For the first time, in the 2014/2015 academic year, there were no college-related fire deaths since I started keeping track in 2000. I really believe this is because of what everyone is doing to raise awareness among students and parents about fire-safe housing and practices, so thank you for all that you are doing! In addition, since 2005, there have not been any fatal fires in residence halls or Greek housing, which is a testimony to what schools are doing on their campuses. 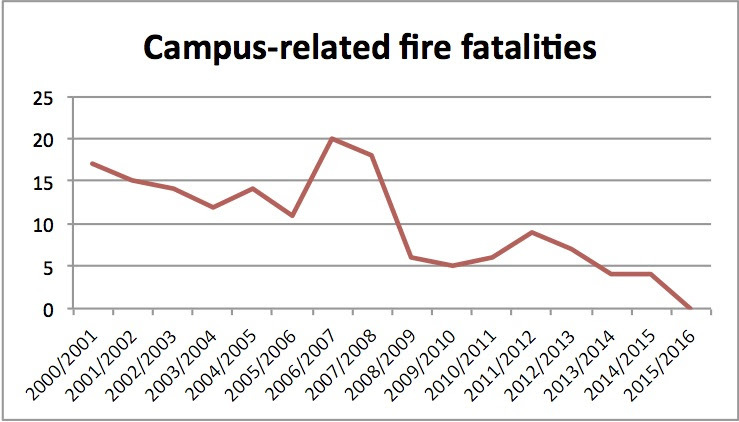 Yes, for the past 11 years, there have been zero fire deaths in residence halls, fraternities and sororities. By LM in News, Safety on August 30, 2016 .